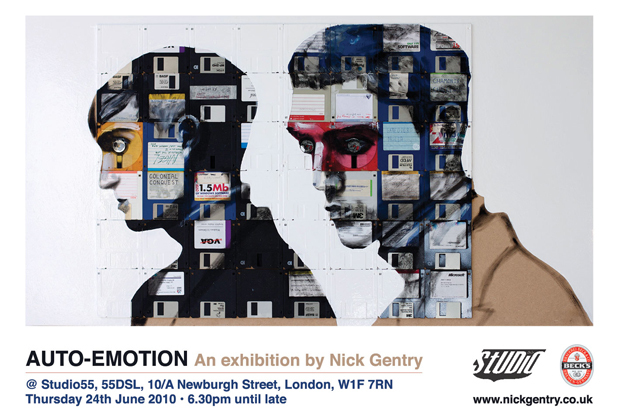 This Thursday (24th June) Nick Gentry will be exhibiting some of his work at the Studio55 space above the 55DSL store on Newburgh Street. Nick’s work represents something quite different to the usual paint on blank canvases, and from one look at the image above I’m sure you can figure out why. Nick uses floppy disks, VHS tapes, cassettes and other obselete storage media to build canvases for his paintings. His work explores the relationship between human beings and technology, and how the advancements of the world wide web have caused the demise of these now outdated memory formats. Auto-Emotion looks set to be a great exhibition, so make your way to Studio55 this Thursday from 6:30pm. As always, entry and beer are free, so there’s definitely no excuse to miss out.